granting my son such a marvelous opportunity to Swim with the Dolphins. I felt extreme exhilaration as a result of Miguel's visit and experiences at Island Dolphin Care in Key Largo, Florida. 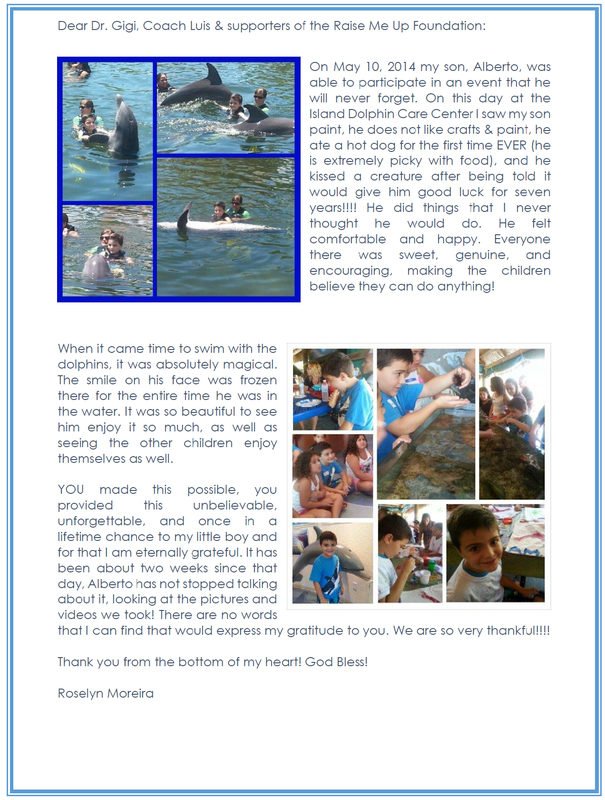 They are a great choice for swimming with dolphins experiences especially for special needs children. This was a truly unique experience for Miguel. enough for this opportunity that means so much to him, and of course to me. Experiences like this mean the world to him. Love, and best wishes for you to continue helping children with special needs, in activities like this. ﻿I wanted to thank Dr. Gigi's Raise Me Up Foundation you for inviting Naomi Zoberg to attend the swimming with the dolphins event. She had an absolute fantastic time and participated in all of the activities as she thoroughly enjoyed herself. She was smiling the whole time! What a special gift of memories your foundation provided for her. You run such a great program and have an abundance of patience working with the kids.